As I have said several times in this blog, Trump often uses confirmation bias in his influence. He creates a mental framework for us to view our world and then waits for future events to fill in the details. 1. Trump knew his “Crooked Hillary” nickname would be reinforced by a continuous trickle of new revelations about Clinton’s misdeeds. We will hear more about Clinton’s email scandal, and more about foreign money buying influence, for example. True or not, the allegations will fit the “crooked” label and reinforce it. 2. Trump’s “Lyin’ Ted” label was also a trap for confirmation bias. Every time you heard Cruz say something that you doubted, the Lyin’ Ted label jumped into your head. 3. Trump knew there would be more radical Islamic terror attacks either here or abroad before election day. 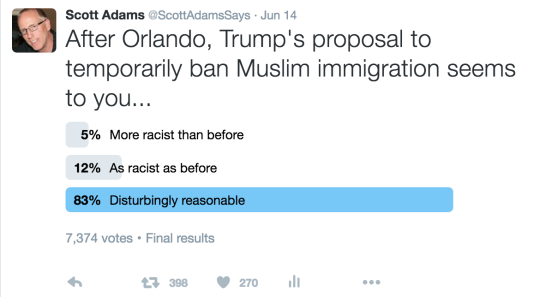 Every attack makes Trump’s proposal to temporarily ban Muslim immigration from selected countries seem more reasonable and more prescient. One of the reasons this form of persuasion is so effective is that it allows people to talk themselves into your point of view over time. People don’t like it when you try to change their minds in person, and almost everyone will resist such an attempt. But if people believe they are evolving in their own thinking – totally independently – they give themselves permission to change. How powerful is this method of persuasion? I recently turned a Trump-hating Muslim into a Trump-liker in about two weeks. It took ten minutes of conversation in person, followed by two weeks of confirmation bias that happened on its own. That’s purely anecdotal, but consistent with what I expected from the persuasion method I used. Team Clinton is also using the confirmation bias persuasion technique with great success. They labelled Trump a racist and waited for confirmation bias to do the rest, which it has. Trump’s avoidance of politically correct speech guaranteed he would trigger cognitive dissonance about his views on race and gender. For example, when Trump suggested that Judge Curiel might be biased because of his life experience – the way 100% of all human beings are biased – Trump was labeled racist. As a legal strategy, what Trump did was aggressive but smart. Either Trump’s claim of judicial bias would influence the judge to overcompensate in favor of Trump, or it would undermine the Judge’s verdict if it went against Trump. Trump’s strategy was good persuasion, except for the part where confirmation bias makes it look racist as hell. But consider this: If a man with African ancestors is born and raised in England, and later becomes a citizen of the United States, we might label him “English” as soon as we heard the accent. And no one would consider that a racial insult because England is a country, not a race. But when Trump referred to Judge Curiel as “Mexican” it sounded racist as hell, even though Mexico is a country not a race. That’s confirmation bias. You expected Trump to be a racist, so that is how you interpreted it. What he meant to say is that people are influenced by their associations, especially when their family members are involved. That part is totally reasonable. But the way you heard it (thanks to the news media) is that Trump was saying a judge is not qualified to do his job because of his race. But Trump never mentioned race. If you heard it as a race comment, that’s cognitive dissonance. Yes, I know Curiel was born in America. That doesn’t change my point. If the judge rules in favor of Trump, he might have a tense Thanksgiving with his relatives. Bias is a real thing. We all have it. Even judges. My view on Trump is that he is a nationalist who often talks about countries but not ethnicities. He rails against China, Iran, Mexico, and other countries. Personally, I have never heard Trump make a negative racial comment. But I have heard plenty of Trump statements that SOUND racist because of the way our minds conflate countries and ethnicities. On a related note, yesterday I used a Trump persuasion trick to get more clicks on a Tweet. See if you can identify the trick before I tell you about it below. The trick is that Islam isn’t a race. Islam is open to all races. I know that, but I still created a tweet that indicates I can’t tell the difference between a race and a religion. Result: People tweeted to inform me that Islam is not a race. Key learning: Sometimes the mistake is the method. Bonus thought. When you pick a name for a baby, you should always think ahead to what kind of cruel nicknames it will inspire. Likewise, when picking a campaign theme, always think ahead to how it could be mocked. 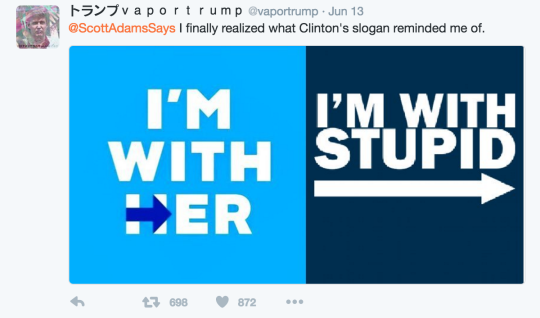 You can’t do much to mock “Make America Great Again.” But when the Clinton team came up with “I’m with her,” they should have seen this meme coming. If you think Mexico is a country and not a race, you might like my book because it has nothing to do with this sentence.